What happens at the Barista Champs? A lot of people have asked me the question, “What happens at the Barista Champs?” and I love answering that question. Attending the barista champs is equally as nerve wracking as it is exhilarating. In this blog post I am going to explain exactly what happens at the barista champs, and why these competitions are so important. 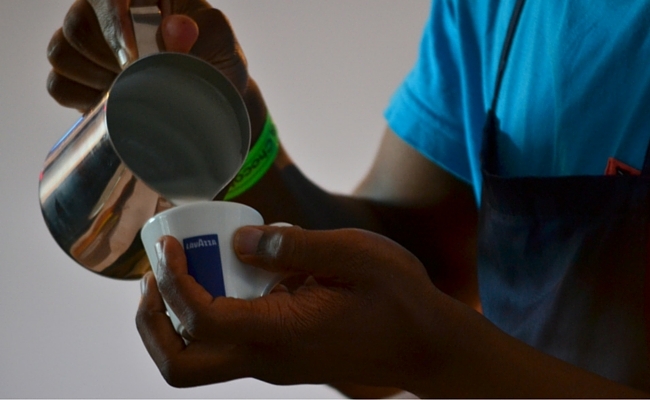 Today is the start of the Western Cape Barista Champs. Baristas from around the province are meeting at the Homemakers Expo, where a stage has been set up for the 3 day competition to take place. Baristas enter the competition prior to it’s start and they can choose which category they would like to compete in : Barista Competition, Latte Art Competition, or the Cup Tasters Competition. What do each of these competitions entail? Let me fill you in. This competition is the busiest and more expansive, of the categories as each barista has only 15 minutes to prepare 4 cappuccinos, 4 espressos, and 4 of their signature drink. White preparing each course they are speaking to the 4 sensory judges and head judge, explaining their coffee and what flavour notes the judges will taste, and why they have chosen this coffee. They have a backtrack to their performance so the whole 15 minutes really is that much like a show. The suspense kicks in when you watch the clock countdown and you hope that the barista will finish in time. Every minute over the allocated 15 minutes is points deducted. I often find myself sitting on the edge of my seat during most sets. Not only are there 4 sensory judges tasting for the flavour notes the baristas have pointed out, but there is a head judge checking the texture of the milk and the presentation. There are also technical judges who watch the baristas making sure they don’t waste any coffee grind, and they watch the tamping methods used, and how the barista pulls their shots. To top it off baristas are also marked on how clean they keep their station. There is a lot that goes into those 15 minutes! A signature drink is any espresso based drink that doesn’t include alcohol or artificial ingredients. The next category is most peoples favourite, the Latte Art Competition. Baristas have to present two pictures of latte art, and are required to replicate each pattern. One pattern is made using a free pour, and the other a design pour. A free pour is straight from jug to cup and the barista uses their wrist and angles to create the shapes in the textured milk. The design pour is also made from jug to cup, however once poured the barista can use a design tool (toothpick, latte art pen) to create extra elements on the textured milk. This is a creative and artistic competition that leave every audience mesmerised at the exceptional latte art. The final category at the barista champs is the Cup Tasters Competition. Not many bystanders are aware of what cupping is, which is why I have written a whole post about it here : read more. As you will see from this image below, freshly ground coffee is prepared and tempered water is poured over the coffee creating a layer of grind at the top and coffee/water underneath. Baristas compete against each other to identify which coffee out of 3 is the odd one out. There are usually up to 8 sets of 3 cups for each barista to taste. 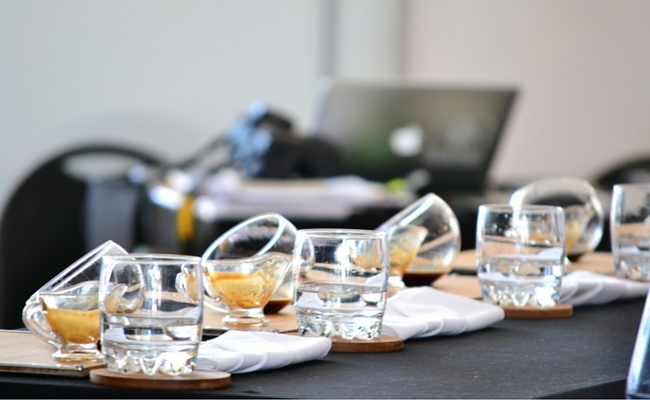 Cupping is great fun to watch as baristas have to slurp up the coffee in order to get the most flavour around their palates. The competition structure usually takes place over 3 days. Day 1 and Day 2 all baristas compete and at the end of Day 2 the top 6 are announced. All 6 go through to Nationals from each region. On Day 3 the top 6 compete to be ranked and for a Regional Barista Champ to be named. 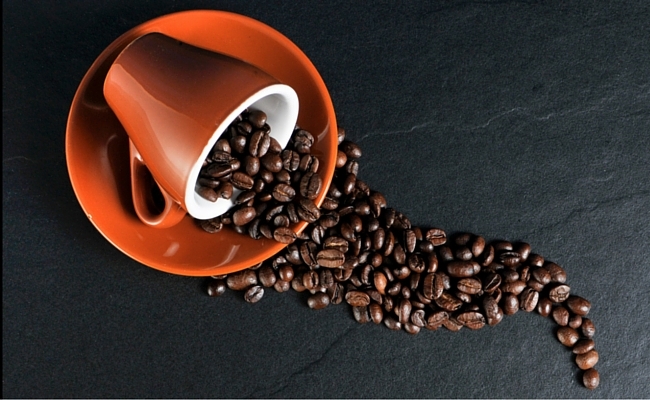 SCASA is the Specialty Coffee Association of Southern Africa and is made up of a number of individuals dedicated to growing the specialty coffee industry in SA. 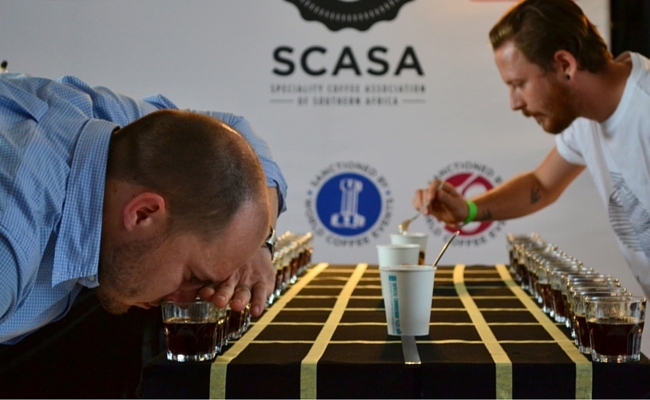 Each province has a committee dedicated to making sure all competitions run as per World Coffee Events standards. These competitions are a fantastic way for local baristas to learn more about coffee and making good coffee. They are also a great way to build camaraderie amongst the baristas and they get to network with industry leaders. I encourage you all, if you get the chance, to attend the barista champs one day. They take place in Durban, Cape Town, Joburg and PE. Our support to these local guys goes a long way in motivating them to produce great coffee for us the consumer. It also is an opportunity for them to educate us on how good coffee should taste and spread the knowledge of specialty coffee. Yes I am passionate about the coffee culture we have here in SA and around the world. Coffee is drunk every second of the day, around the world, so why drink bad coffee when you can drink exceptional, specialty coffee, made by local baristas who love what they do. Let’s #supportlocal and together we can impact lives through every cup of coffee we drink.